This vast park is dominated by mountains and ice in Canada's extreme alpine zone, making it a magnet to mountaineers and rugged adventure-seekers. 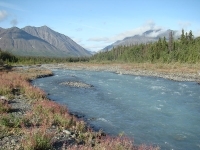 The landscape includes mountain lakes, alpine meadows, tundra, and swift cold rivers. At the heart of the park is Mount Logan, rising up in the midst of an ice field to 19,545 feet (5,959m); the highest mountain in Canada. Local tour operators in Yukon towns offer a variety of memorable daytrips and excursions into the park, featuring a wide range of activities such as canoeing, nature walks, rafting, fishing, hiking, and mountain biking. Air trips over the area are also a very popular way to sightsee. The Kluane National Park Visitor Reception Centre is at Haines Junction, near the Alaska Highway.